The Shoreline Management Tool is a geographic information system (GIS) based program developed to assist water- and land-resource managers in assessing the benefits and effects of changes in surface-water stage on water depth, inundated area, and water volume. Additionally, the Shoreline Management Tool can be used to identify aquatic or terrestrial habitat areas where conditions may be suitable for specific plants or animals as defined by user-specified criteria including water depth, land-surface slope, and land-surface aspect. The tool can also be used to delineate areas for use in determining a variety of hydrologic budget components such as surface-water storage, precipitation, runoff, or evapotranspiration. The Shoreline Management Tool consists of two parts, a graphical user interface for use with Esri™ ArcMap™ GIS software to interact with the user to define scenarios and map results, and a spreadsheet in Microsoft® Excel® developed to display tables and graphs of the results. The graphical user interface allows the user to define a scenario consisting of an inundation level (stage), land areas (parcels), and habitats (areas meeting user-specified conditions) based on water depth, slope, and aspect criteria. The tool uses data consisting of land-surface elevation, tables of stage/volume and stage/area, and delineated parcel boundaries to produce maps (data layers) of inundated areas and areas that meet the habitat criteria. The tool can be run in a Single-Time Scenario mode or in a Time-Series Scenario mode, which uses an input file of dates and associated stages. The spreadsheet part of the tool uses a macro to process the results from the graphical user interface to create tables and graphs of inundated water volume, inundated area, dry area, and mean water depth for each land parcel based on the user-specified stage. The macro also creates tables and graphs of the area, perimeter, and number of polygons comprising the user-specified habitat areas within each parcel. The Shoreline Management Tool is highly transferable, using easily generated or readily available data. 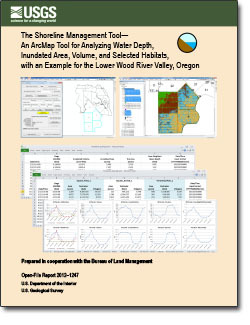 The capabilities of the tool are demonstrated using data from the lower Wood River Valley adjacent to Upper Klamath and Agency Lakes in southern Oregon. Below are publications associated with this project. Below are partners associated with this project.